There’s much more to Aladdin than its often shirtless male chorus, although that certainly doesn’t hurt. Not that there’s anything incredibly substantial about it – this is brisk, lively, even jazzy musical comedy. And, as such, one of the more successful Disney screen-to-stage musical transfers. The setting may be the Middle East, but this version of the tale of a poor street boy wooing a princess with the help of a genie is pure screwball romantic comedy, like the original. Director/Choreographer Casey Nicholaw brings a little of that to every show he directs, and he lays it on thick here, to deliriously over the top effect. Of course, one of the most exciting things about the film was Robin Williams’ hyperkinetic, hilarious voicing of the Genie. You can’t do a version of Disney’s Aladdin,and not have a Genie that, one way or another, rises to that level of comic hysteria. 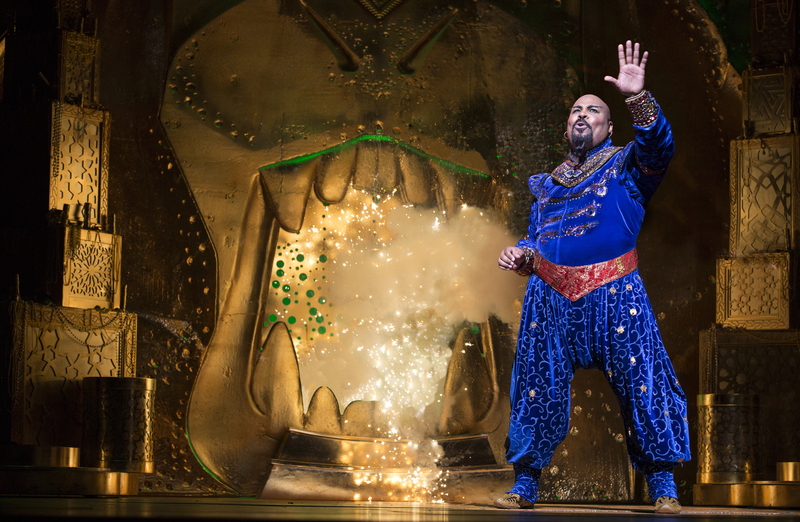 Happily, James Monroe Iglehart has just the twinkle, crazy energy and deliciously shameless hamminess that the role calls for, especially for his biggest number “Freind Like Me”, which truly pulls out every stop in sight. Aladdin (Adam Jacobs) and Jasmine (Courtney Reed) are, as in the movie, pretty and just clueless enough to each have their coming of age moments. This ain’t Ibsen, and Jacobs and Reed play their parts with just the right light touch. Jonathan Freeman, who voiced the evil vizier Jafar in the film, reprises his role here with the same basso oily malevolence. His beard, however, is a touch too cartoony compared to the other hair work in the show. Plus, this version has several songs with lyrics by the film’s original conceiver and lyricist Howard Ashman that were cut from the film. Most of them are for a trio of “street rat” pals of Aladdin’s – who were replaced by the monkey Abu in the film – and are quite fun. Nicholaw has wisely cut all “talking animals” from the story, making Jafar’s lackey Iago human rather than a parrot – and Don Darryl Rivera really goes to town with the re-conceived part. Aladdin ain’t Oklahoma, it ain’t even The Lion King. It’s just great fun. I think Nicholaw and company set out to make light yet spectacular family entertainment, and they have succeeded marvelously. Recommended. The duo of John Pizzarelli and Daniel Jobim playing and singing bossa nova are the ultimate in cool. 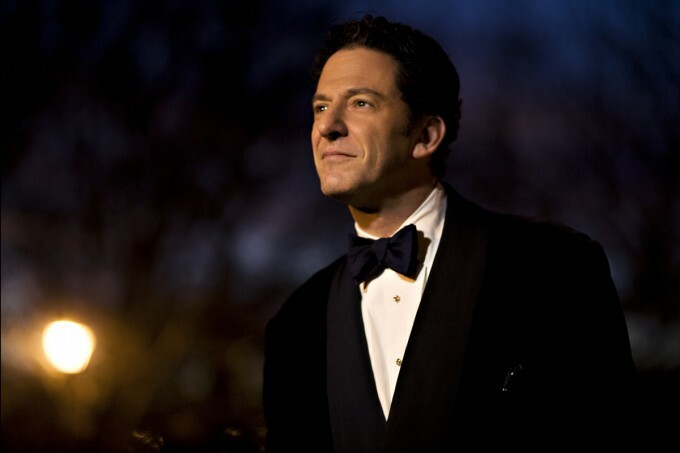 Pizzarelli represents the very height of cabaret’s jazzier side, with profound musical intelligence at work. Jobim is part of a legendary Brazilian musical dynasty: his grandfather was Antonio Carlos Jobim, one of Brazil’s all-time greatest songwriters and composers, and one of the original architect’s of bossa nova. This act, entitled “Strictly Bossa Nova” is supremely laid back, in true bossa nova spirit. Laid back, yes, but also full of panache and musical elegance. Even the patter isn’t really patter, just a couple of very witty friends sharing stories and jokes. They apply bossa nova style, not only to songs originally written in that style, but to great North American songs like the Gershwins’ “Fascinating Rhythm” and Cole Porter’s “I Concentrate on You”, both of which respond beautifully to the bossa nova treatment. They even apply it to Paul McCartney’s marvelous American Songbook tribute “My Valentine”, together with choice stories about Pizzarelli working with Sir Paul. Still, the most sparkling parts of the evening are songs by Antonio Carlos Jobim, most of all his bristlingly poetic “Waters of March”. The only bossa nova evening I like nearly as much as this was another Pizzarelli act, and I think this is even better than that one. Highly recommended.